A few months ago a friend asked me if I ever shopped at CVS and Walgreen’s. I told her very seldom do I shop at either because their prices are too high. Well, my friend then began telling me how people are able to save a lot of money shopping during the sales and by using coupons. Now, when it came to coupons I very seldom used them. In my area we have no store that doubles them and most coupons tended to be for items I seldom used. But, after researching the internet I found several web pages and blogs that talked about saving money by using coupons. My favorite blog, that offers the most information, is Money Saving Mom. I have always been a bargain shopper and I have always stocked up on good deals in order to save money. Learning to use coupons has been a very fun and rewarding venture. I do not get 25-dollars in groceries and pay less than 1-dollar but I am saving money on items we would normally buy. My next stop was Wal-Mart; along with other items I purchased 4-cans Old El Paso enchilada sauce, 1 bottle French’s mustard, 1 bottle Cattleman’s barbeque sauce and 1 bottle Kraft salad dressing. I had a coupon for $1 off when you buy any two Old El Paso products; each can cost 96-cents so after coupons I paid 46-cents per can. I also had a 50-cent coupon for the mustard; the mustard was 83-cents so I paid 33-cents for the bottle. The salad dressing was $1.58 and my coupon was for a free bottle. The Cattleman’s barbeque sauce sold for $1.68 and my coupon was for 75-cents off so I paid 93-cents for the bottle. Plus, the barbeque sauce came with a mail in rebate for the total purchase price which means it will be free after I send in the rebate form and the 75-cents I saved with the coupon more than covers the cost of a stamp needed for the rebate. Using coupons has turned out to be great fun. I have really enjoyed learning about them and I am getting better each time I use them. Each year we try to have a garden but it isn’t always easy, especially since I have hay fever and most of the weeding is left to others. Last year we did pretty well and grew some wonderful carrots, watermelon, cantaloupes and tomatoes. Our potatoes didn’t make a thing; our cucumbers all had a bitter taste; and our green beans only produced enough for about two meals. This year I decided to see how potatoes would grow in containers. I planted several containers and so far they are looking pretty good. Our tomatoes almost died when we moved them outdoors. I pretty much gave up on them until one day I noticed a new leaf on one. The tops of the plants are dead and dry but new stems and leaves are coming up wonderfully from the bottom. I still need to plant my green beans, cucumbers, watermelon, cantaloupe and peppers but I am in no hurry. The very first garden I ever planted was in the middle of July and it did very well. Today I received a new Kitchen Aid Mixer. My older mixer is 15-years old and works just fine, but my husband decided I needed a more powerful one. Both mixers look just alike but one is a 325 watt and the other a 575 watt. What does one do with a new mixer? Why you make bread! This evening, after the sun went down, I got busy and tried out my new toy. Elizabeth loves to use her play dishes when I cook so we made two miniature loaves just for her. Yummy, the house smells so good. Breakfast will be homemade bread with homemade grape jelly. Here is block 5 from the quilt along; it turned out to be a challenge with so many small pieces to stitch together. 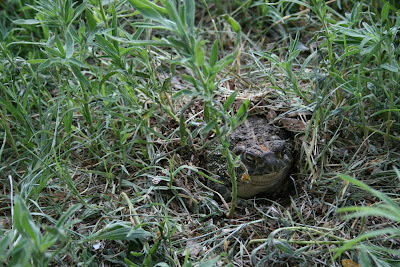 This morning when I went outside to check on the chicks I spotted a toad from the corner of my eye. 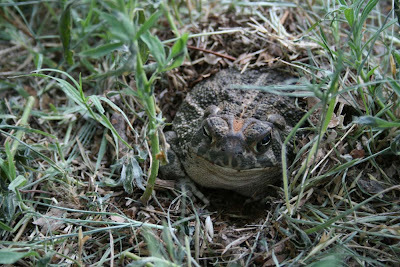 He was buried slightly under grass and dirt and if not for a slight movement I don’t think I would have noticed him at all. Each time I come across small creatures like this it makes my day! 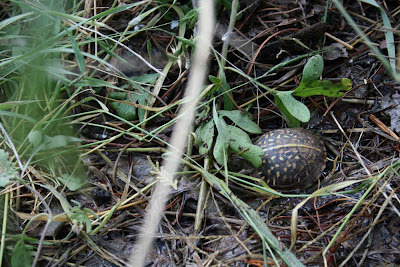 Yesterday we saw the cutest baby turtle under a pine tree drinking water. He didn’t mind us watching him until we began pulling back weeds to get a better look, then he decided it was time to move along. 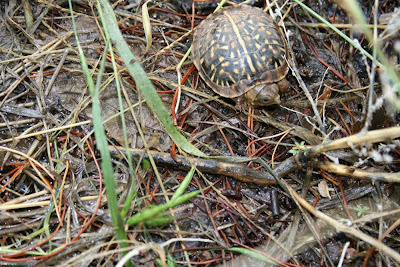 I love small turtles, they look just like a toy. My family loves popcorn; it is one of our favorite snacks. Normally we buy it from the snack depart at Target but when we don’t have any Target popcorn then I make it at home. I begin with an old aluminum pot and add oil, margarine, popcorn kernels and season salt. Next I cover the pot with a cooking guard. I like using this guard because it lets the steam out and the popcorn isn’t as chewy. I also like watching the kernels as they pop. While the kernels are heating up I like to continuously shake the pot so nothing burns. Because the salt and margarine is added in the beginning all flavors are distributed evenly. Now make a nice cold drink and your set for a movie or a good book. Our chickens now have a nice spacious new portable chicken coop in the great outdoors! They were cooped up in the cardboard box for too long while we were making time to work on a safe pen for them. 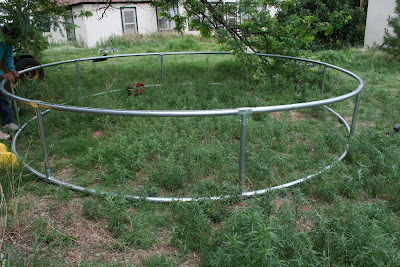 We started our project with two discount store trampoline frames. We took the two top rails and one set of legs to create the outside structure. 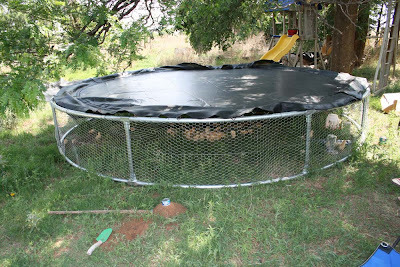 Next we took 2-ft. tall chicken wire, 50-feet of wire in all, and encircled the outside of the frame. Each section between the legs is secured with wire. 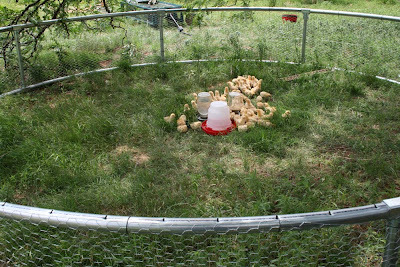 Once the wire was attached we were able to release the chickens so they could experience their new environment. We now had to stand guard to keep the cats out and the dogs from digging under the pen. 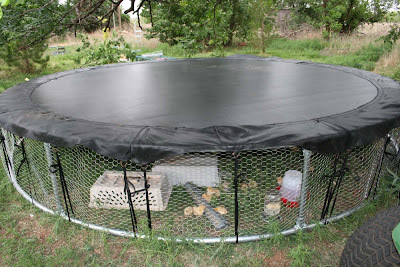 The top is made up of a trampoline mat with extra fabric added to the sides that cover the springs. 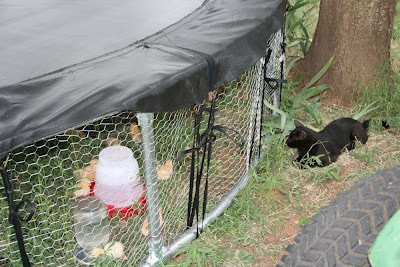 This was necessary to keep the cats from crawling between the springs to reach the chicks. 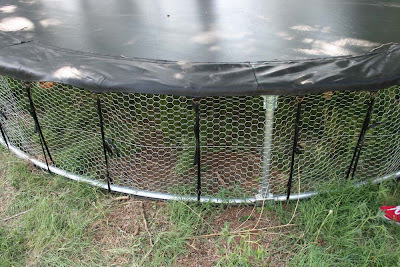 This flap is held in place with rings and thin straps tied to the bottom of the frame. 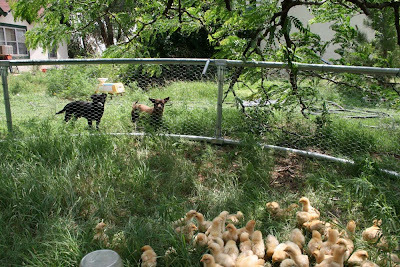 Now the chickens will have many happy days playing outside while staying safe from the dogs and cats. Hally, short for Halloween, is very interested in the chicks. Hopefully he wont find an area we overlooked. 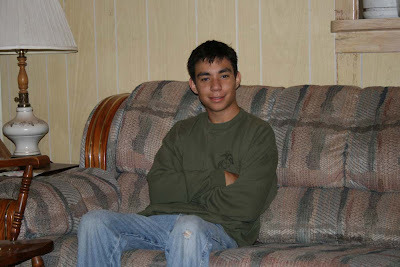 Today is Jonathan’s Birthday; he is officially considered an adult! 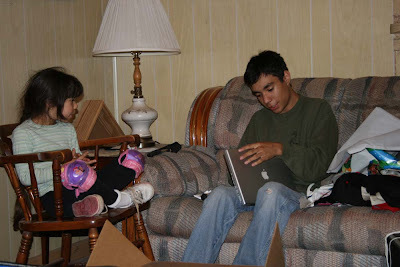 I had wanted to buy him a car for the big “18” but instead we settled on a laptop. This was a necessity since he would need it for college in the fall. 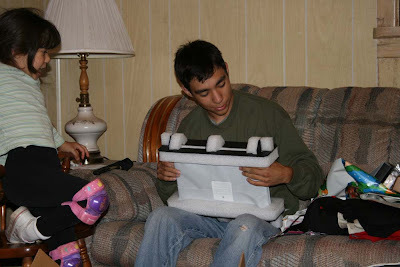 Each year it gets harder and harder to surprise him with a gift. The birthday menu consists of Pizza and a Movie! Well, the wedding is now over and what a stressful time working on the cakes turned out to be. 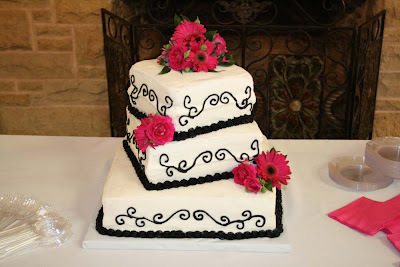 It all began with the icing wanting to droop on the sides of two tiers. No matter what I did I couldn’t get it to work out the way it needed to be. So in the end I had to deliver the cakes just the way they were. Thankfully once the fresh flowers were added all attention was focused on them instead of the droops. Everything went well with the groom’s cake, which was such a nice relief. I am so happy for the newlyweds and so thankful I don’t have to worry about the cakes anymore. On Saturday we will be attending the wedding of a family friend. The wedding cake and the groom’s cake are both being supplied by me. A lot of planning goes into cakes. As well as a lot of ingredients. Then bright and early this morning I was back to baking. My day will not end until later this evening and then it will be time to deliver and set up the cakes bright and early Saturday morning. Last month we ordered 70 Buff Orpington hens and 5 Buff Orpington roosters. The estimated ship date was to be May 17th so first thing on Monday the 19th we began calling our local post office. The chicks did not arrive until today, and boy were we all excited! The chicks are so cute and very loud! The kids jumped out of bed as soon as I arrived home from the post office. We all had to touch and hold the cute little fuzz balls. They have been drinking a lot of water and eating food and Elizabeth pulled weeds for them to play with. The last time we had chickens was several years ago and at that time the coyotes came once a day to feast on them for lunch. Hopefully we will be able to prevent that this time. I love how chickens make a home feel so cozy and alive with life. Elizabeth is very anxious to learn how to sew. I thought it would be best for her to begin with handwork first. 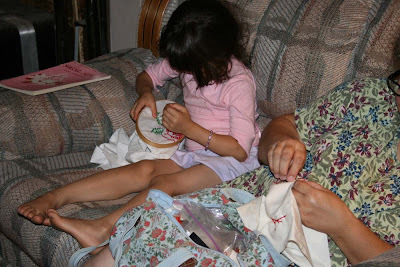 She wasn’t doing very well working on her cross stitch on her own so now most evening we will sew together for about 30 minutes She is currently working on a cross stitch apple that I had intended to make into a hand towel, but instead I am going to turn it into a miniature quilt and add it to the other quilts I am planning on putting on her bedroom wall. Here is block number 4 in the quilt along. Sometimes it is hard being patient as I am anxious to see my completed quilt! I had good intentions of making quilts for the upcoming birthday party this evening but since our day of celebration lasted much longer than I had anticipated my quilt plans had to change and I needed a new quick gift idea.The birthday girls are just entering into the world of Home School which means they will be visiting the library often. For this reason I decided to make each one a book bag. The birthday girls each have a favorite color, red and green, so I began my planning around these two colors. I first began searching my fabrics for some denim fabric, green fabric and red fabric. Next I machine embroidered each girl’s name on one side of the bag and added a Playful Sunbonnet Sue, reading a book, embroidery design above each name. My designs came from Designs by JuJu. The next step was to add a pocket to the back of the book bags. To each pocket I added an appliquéd alphabet using the red and green fabrics and also trimmed the top of the pocket in the same fabric. My appliquéd alphabets came from Embroider RN Designs. For the finishing touch I lined each bag in the red and green fabrics. Even though I was not able to get the quilts finished I am still pleased with my last minute gifts. Jonathan’s graduation was very nice and the celebration didn’t end until 11:30 PM. We ended up visiting until evening and then ate dinner with some friends at Chili’s. I don’t have any photos of the ceremony since I was part of the festivities and wasn’t able to take photos. There was a photographer taking photos but those pictures will not be available for several day. After dinner Jonathan had a childhood friend, Andrew, come over to spend the night and at the same time another family friend was in town and dropped by to say hello. All in all we could not have asked for a better day or a nicer celebration. 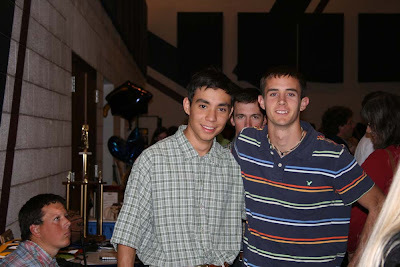 This is Andrew and Jonathan at the reception that followed the graduation. As part of the graduation each graduate sets up a table with memorabilia from their childhood as well as items from their current interest. The tables were set up in the gymnasium at the church where the ceremony took place. 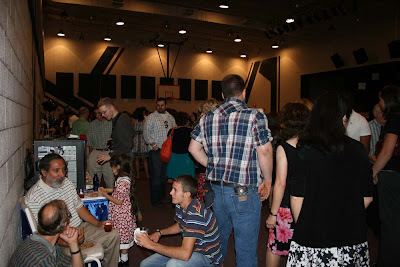 The guests really enjoy looking at the tables and visiting. Graduations are a good place to catch up with old friends.